Elderly couple, Mr A and Mrs B are staring through french windows at a cat that is sitting in the middle of their lawn motionless and facing away from them. A car is heard drawing up. The last couple of tutorials have been a bit heavy, so this week’s tutorials are going to balance that out by being a little light. We’re having a look at a couple of different aspects of the Python language. Unwinding this is a little tricky – for each element in [1,2,3] it runs through each element in [3,1,4] (ie 9 comparisons in all) and appends the tuple if the elements are not equal. List comprehensions provide an easy shorthand for constructing lists. Moreover, they are often more readable than writing out the for loops explicitly. The second topic is tuples. So, if a tuple does what a list can do, only less, why bother with a tuple? Why not use a list? Well, tuples are easier for the Python interpreter to deal with and therefore might end up being faster. Tuples might also indicate that you have an ordered list where the ordering has some meaning (for example, a date tuple might store year, month and day (in that order) in tuple). The fact that you’re using a tuple then flags that each of the entries has a distinct meaning or use and that their order is significant. Another pragmatic reason to use a tuple is when you have data which you know shouldn’t change (like a constant). So, if you accidentally try to change one of the tuple’s entries, you will have an error thrown. * as per Don’s comment, you can use any iterator, but we haven’t talked about them yet, so they don’t yet exist. One of the women goes over to the set and switches it over. As she goes back to her seat from the radio we hear the theme music again, fading out as the sounds of [comic] violence and screaming start again and continue unabated in vigour. Man’s Voice: I think she’s dead. Woman’s Voice: No I’m not! In our last tutorial we substituted a graphical representation of a chess board for a, rather more boring, textual one. This tutorial, we’re going to move our representation into three dimensions with an isometric view of the same Model. 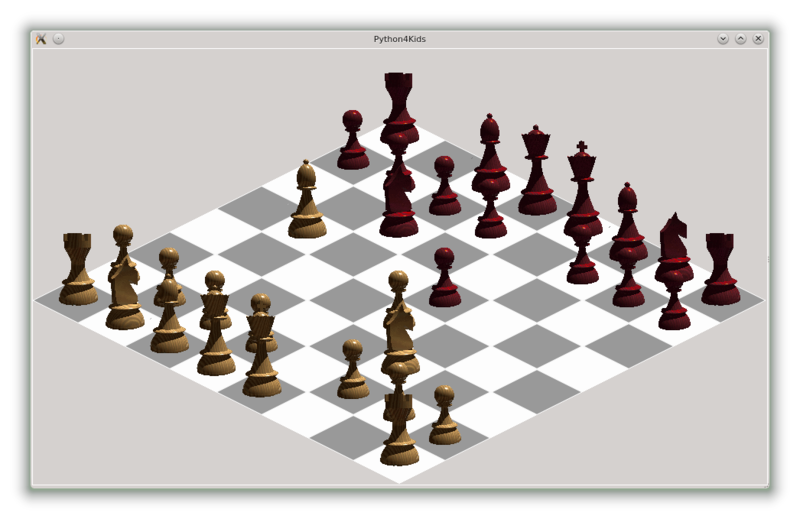 You are probably familiar with isometric views as they are often used in video games. Isometric representations attempt to give a three dimensional view of a subject, but without a perspective distortion (when there is a perspective parallel lines meet somewhere). The board is totally wacky. For each row, each successive tile needs to be lowered by 30 pixels below the previous one. For each column, the tiles need to be moved to the right by 60 pixels, and shifted down a bit. 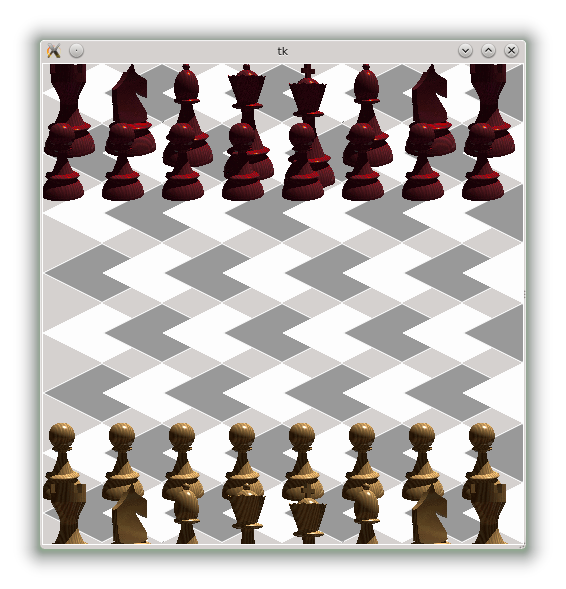 The chess pieces are aligned incorrectly – their tops match, but their bases do not (this is because we used anchor = NW in the previous example). The pieces also don’t line up with the centre[sic] of their tiles. The pieces themselves also take up more than one tile on the board. So, we need to allow more space in the canvas for the board to fit into and we also need to change the way tiles are laid out on it, as well as sorting out how the pieces match the tiles. 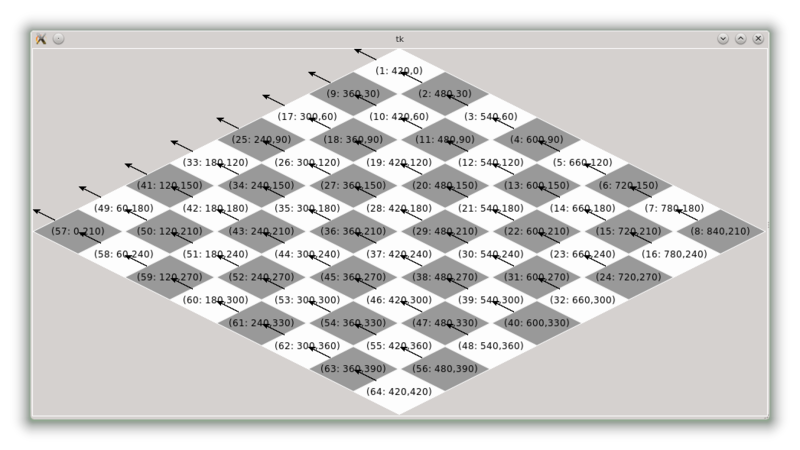 The numbers printed on the board (eg 1:420,0) show: The order in which the tile is drawn, then the x location, then the y location. You will notice that all of the arrows point to a position outside the tile itself. That is because in all of the tiles there is a triangle of transparency in every corner. The tiles really are positioned with their top left corner at the arrow’s location. Moreover, the tiles at the bottom (the row apparently closer to us, used for the white pieces) were drawn last. Those at the top were drawn first. The next problem that we have to deal with is the fact that the pieces are of differing sizes. This, of itself, means that we can’t place them on the canvas by reference to their top left corners (this would mean that their tops would be aligned, but their bases would be out of alignment). Instead we have to place them by reference to their base. Each of the images for the pieces has been specially designed so that there is a transparent area (of 21 pixels – you get this number by trial and error or mathematically*) from the bottom of the gif. The images are also 120 pixels wide (ie the width of the isometric tiles), with the piece centered in that space. The tallest piece is the king, weighing in at 150 pixels (including the transparent area). However, the base of the king aligns with the base of the tiles, so there is an overlap of 60 pixels. This means that there needs to be another 90 pixels of headroom above the board to accommodate the height of the king. This is calculated automatically in the view. In the code, we now calculate the location of the bottom lower left hand corner and use it to to draw both the tiles and the pieces. I have commented out the Model entirely, importing it from the previous tutorial’s code. You will need either need to change last tute’s file to be mvc2.py or the import line to refer to the file you saved it as (or uncomment the Model code). # Use the Model class from the previous tutorial. # if you can't find the previous tutorial just uncomment the definition below. then post processed in GIMP. #        white_pieces =  "R N B Q K B N R"
# SW  (ie bottom left). self.clickList.append(BoardLocation(7-i, j))  # 7-i because the Model stores the board in reverse row order. (look it up) for describing the screen. AND assumes that y increases going upwards not downwards. # so we need to explicitly return -1 rather than just int(a) etc. 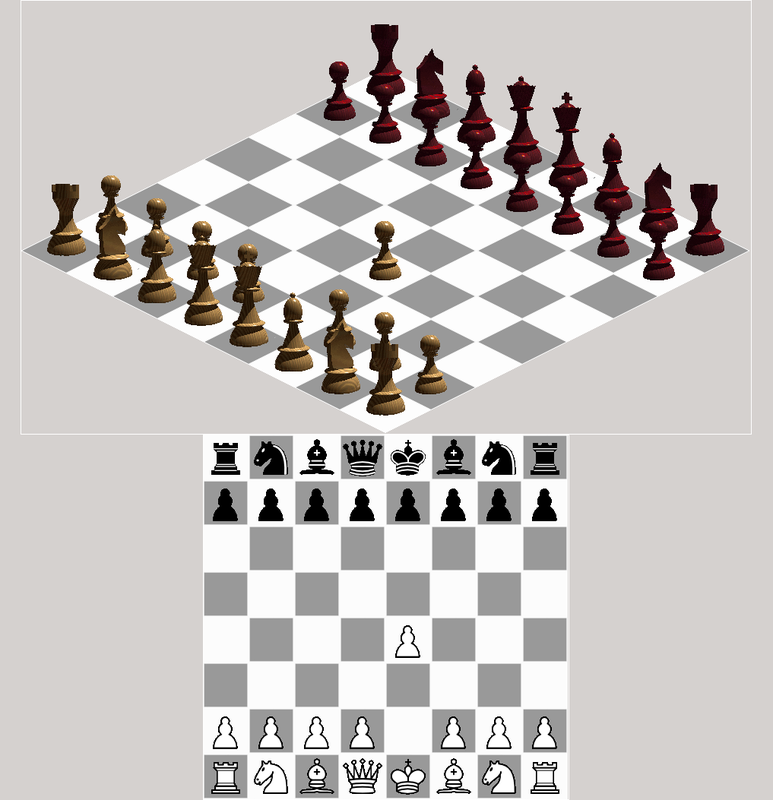 Both boards are kept in sync – so, if you make a move on either of the board, it is shown on both. In fact, you can click a starting square on one board, and a finishing square on the other and it will do the move for you. Having two boards like this on the same computer screen may not be of much practical value, but it does demonstrate that a controller can administer more than one view at a time. Each of these views might be on a different person’s computer, for example. * the approximate “y” dimension of the base of each of the pieces (if just the base was drawn) is roughly 18 pixels, so the vertical centre is about 9 pixels from the bottom (non-transparent) pixel of the piece. The tiles are 60 pixels high, so their vertical centre is at 30 pixels high. If the vertical centre of the base is at the vertical centre of the tile then the piece needs to be padded with 21 pixels below it (21+9=30). ** The Tkinter canvas does have a mechanism for tagging things drawn on it. Instead of calculating the location of the tiles they (and the pieces) could, instead, be tagged (with eg, the coordinates of the tile/piece) and those tags read and parsed by the handler. However, that brings with it other problems, such as overlapping of the tiles and pieces.